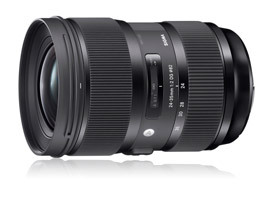 Announced in the summer of 2015, the Sigma 24-35mm f2 DG HSM Art is a high-speed, constant-aperture, full-frame zoom covering three of the most commonly-used wide-angle focal lengths; 24mm, 28mm and 35mm. With a bright maximum aperture, this single model is designed to compete with the equivalent fixed focal length f1.8/2 and f2.8 lenses from Canon and Nikon. 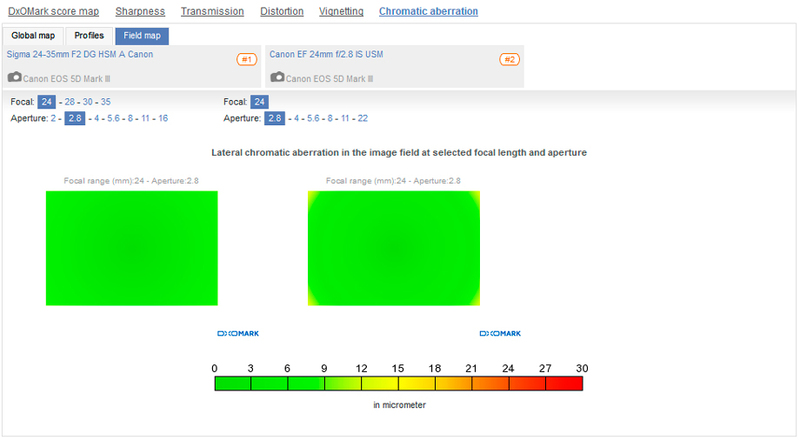 On an APS-C camera, the Canon-mount model has the equivalent focal length of a 38-56mm lens. This wouldn’t be an Art-series lens without a complex optical construction and a judicious mix of exotic glass types. It has an optical formula consisting of 18 elements in total, arranged in 13 groups, and among those, it has one FLD-type low-dispersion element with similar performance to fluorite, and seven SLD (ED-type) elements. Two of those SLD elements are aspheres to reduce lateral chromatic aberration, field curvature, and spherical aberration, while a third large-diameter asphere is used to minimize distortion. Like previous models, it has a sonic-type AF motor, now with what Sigma claims is an optimized algorithm for smoother focusing. It has a minimum focus distance of 11 inches (28cm), and with a 82mm filter diameter, the lens measures 3.4 x 4.8” (87.6 x 122.7mm) and weighs 33.2 oz (941g). It is available for around $999 (USD). 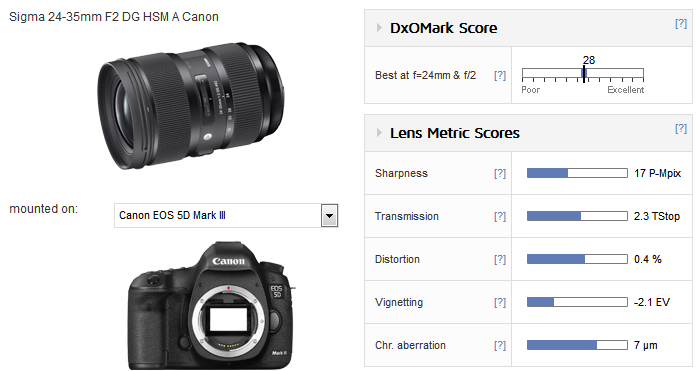 With a DxO Mark lens score of 28 points on the Canon EOS 5D Mark III, the lens is a very high performer, which is all the more remarkable, given the bright f/2 maximum aperture. It is a lot harder to correct a lens such as this than one with an f/2.8 maximum aperture. Even so, the transmission is measured at T2.2-2.4, equivalent to –0.3-0.5 EV below the stated F-value, but that’s still very good. Canon’s vaunted 24-70mm f/2.8L II is a T2.9-3.2, or –0.1-0.4 EV below the stated F-number. It has good consistent sharpness at f/2 throughout the range, but stopping down improves both sharpness and uniformity, particularly at the shorter end. Some slight astigmatism is noticeable at the 35mm focal length. Best of all, lateral chromatic aberration is exceptionally low, even at 24mm f/2. Control of distortion is generally good, with some barrelling at the wider end, but it has slightly high levels of pincushion at 35mm. Before we take a look at models from competitors, let’s compare this lens with Sigma’s 35mm and 24mm Art f/1.4 series primes. 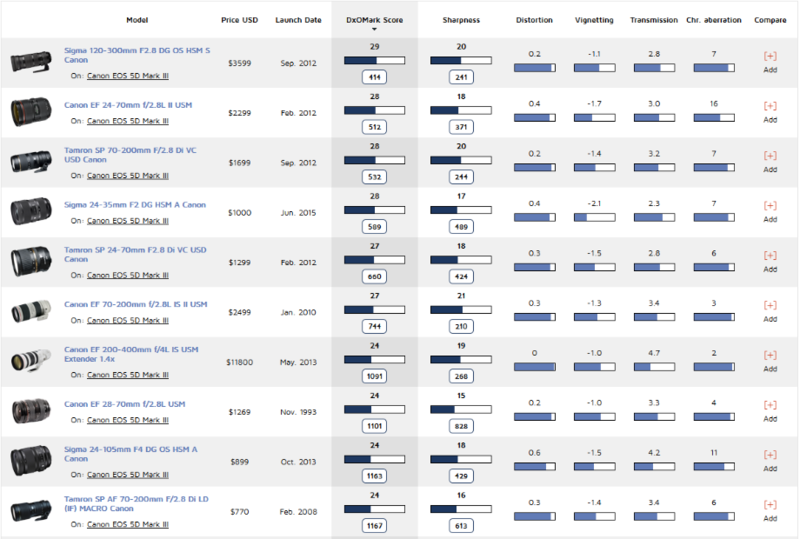 From the overall scores we can see that the new zoom model isn’t far behind the 24mm. The prime is sharper at f/2.0, but the zoom matches it at practically every other aperture and has similar levels of distortion and peak levels of lateral chromatic aberration. 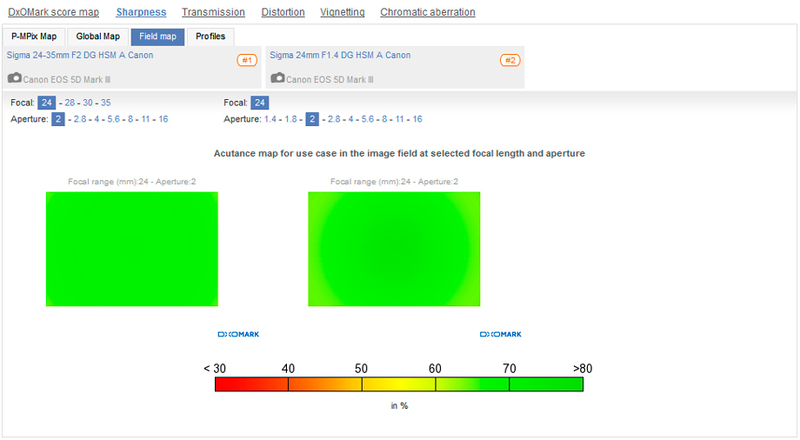 In fact, the zoom has less CA in the corners but slightly higher levels across the field. The new zoom is not too far behind the 35mm lens, either. Again, the prime is sharper at f/2 in the center, but the two are close at other apertures, albeit with the f/1.4 model just slightly sharper. Although the prime has slight barrel distortion as opposed to the zoom’s pincushion at 35mm, both have a very similar pattern and levels of lateral chromatic aberration. The Sigma zoom is up against recently-refreshed models from Canon, and they’re both established performers. The 35mm is one of the best performers in Canon’s lineup. They’re also attractive for their adoption of stabilization technology, but the 24mm is a slower f/2.8 model. 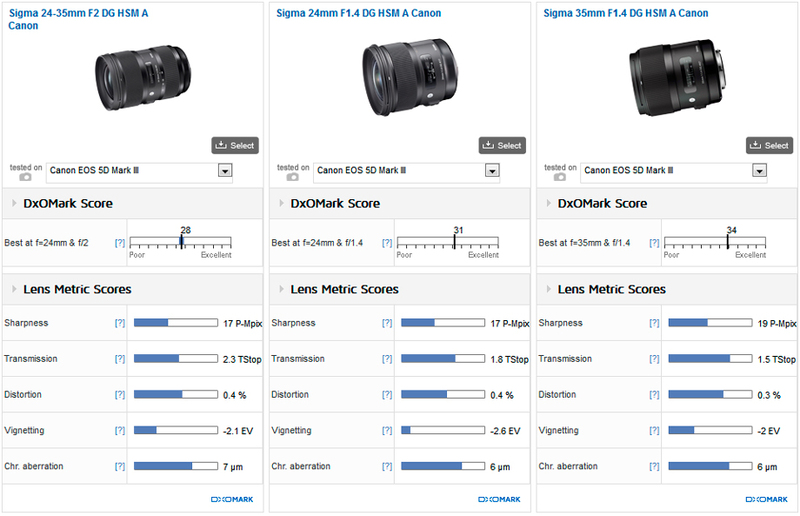 Overall, the Sigma is rated at the same level optically. It is close for peak sharpness, but has lower distortion and chromatic aberration. Although the Sigma isn’t as sharp wide open (at f/2 versus f/2.8), it is matches in sharpness at most other apertures and even has slightly better uniformity. The Sigma has lower lateral chromatic aberration at f/2 than the Canon has at f/2.8, where for the latter, LCA can be noticeable in the corners. Against the Canon 35mm at f/2-2.8, the Sigma isn’t quite as sharp in the center, but it has a somewhat flatter field and is slightly sharper at the borders and corners. 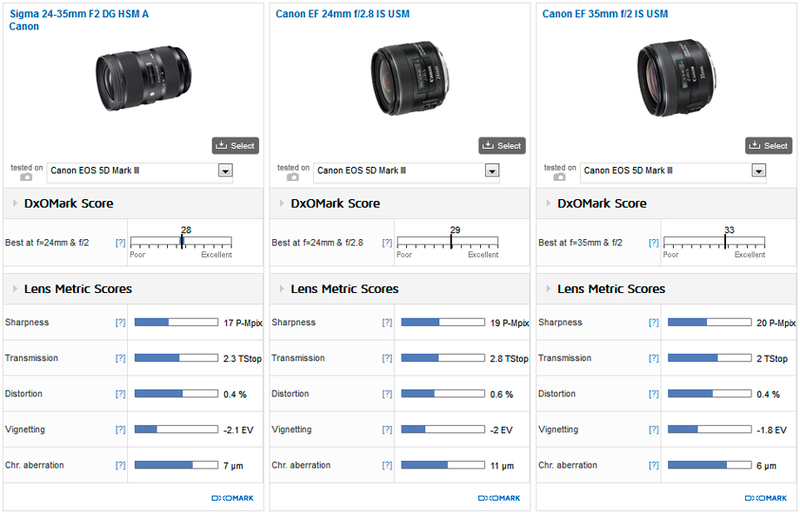 By f/4, the Canon is in the lead, but there’s not much in it, and by f/5.6, the two show very similar performance, with similar sharpness in the center and some astigmatism in the outer field. However, while the Canon has heavier and more noticeable vignetting, it has much lower chromatic aberration across the field, with the exception of the corners, where the fringing is around the same level as the Sigma. At around $999, the Sigma 24-35mm f2 DG HSM A is certainly an intriguing option for Canon users. Image quality challenges Canon’s 24mm f2.8 IS and 35mm f2.0 IS primes once stopped down, and saves around $200 in the bargain. With the 28mm f2.8 IS at around $569, there’s even more tempting savings to be had. Optical quality like this costs money. The Canon models have stabilization, which is difficult to put on a price on, but others might be more attracted by the zoom’s flexibility: changing lenses is a chore at best and is especially so in hazardous environments. Sigma has done well to introduce this model, but it is so good that it’s in danger of competing with the company’s own high-speed f/1.4 models. However, while they stand out for their quality at wider apertures, this new zoom is rather the more practical and arguably more useful option for everyday shooting.